The government is making urgent enquiries to find out if any high rise buildings in the country have combustible claddings, in the wake of the horrific Grenfell Tower apartment building fire in London. Early indications are that the Grenfell Tower building could have been clad in combustible materials which may have caused the fire to spread rapidly throughout the building. Building and Construction Minister Nick Smith said the Government amended this country's Building Code in January to restrict the use of combustible cladding systems in buildings, following fires in Melbourne and Dubai. "I am advised that these systems are not prevalent in New Zealand," Smith said. "I have asked the Ministry of Business Innovation and Employment to contact councils and check whether any high rise buildings have been constructed with these materials prior to the amendments earlier this year." 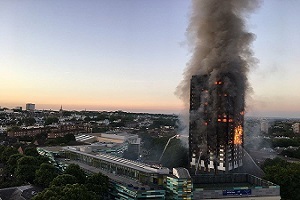 Smith said the Government was also tightening fire safety requirements for high rises in proposals put out for consultation in May, which would clarify the responsibilities between structural and fire engineers and tighten the verification methods for claddings. "New Zealand's style of housing is shifting, with more people living in high rise apartments that carry greater risks from fire hazards," Smith said. "Our building regulations need to keep pace with this change in living styles and ensure that New Zealanders never experience what happened in the Grenfell Tower in London. "We will be watching the detailed inquiries into the London disaster to see whether there are any issues relevant to New Zealand's building and fire regulations," he said. As of last January? Did you read the article? I would not want to be owning Fletcher shares at the moment. If they have a faulty cladding this would be a massive product recall. Kind of puts me off buying any apartment, especially in high rises. It's astonishing and heartbreaking that a disaster of this magnitude could happen in a 1st World City in 2017. A full inquiry needs to be established immediately to find out what went wrong and how many other buildings are at risk. They then must be fixed without delay, wherever they may be. There simply are no excuses for this. Over 10 years ago now in London I knew a guy who was on a job on an apartment block where they were cramming more people in. Gutting whole floors out, reduce the footprint of each apartment by 10%, result 10% more tenancy or thereabouts. I couldn't believe it. One would wonder if the emergency escapes and associated safety features were bolstered in such situations. This inexcusable tragedy makes me so angry. That said there are plenty of other examples I can think of where wooden panelling/facades/divider walls, combustible textile and tiles are used in multi-story residential buildings and no one seems to bat an eyelid. But you would have thought all that was standard in this day and age. Although if you are at the top, how do you get out if it is all down below? should the fire not be able to spread from unit to unit, or at least from floor to floor. It is horrendous. The London Councils are proposing that all multi story building have internal building and external cladding fire protection sprinklers fitted which sounds very reasonable. Retrofitting sprinkler systems sounds like a pretty big and expensive job to me. Who's going to foot the bill? The same people who foot the bill for fire safety upgrades in New Zealand: the owners. In London they've apparently put the cost of even heat or smoke detectors ahead of a human lives and early fire service intervention. If we can manage it here they surely London can as well. I believe I saw in the Herald this morning Supreme Reverse Midas Nick Smith preemptively declaring there's "nothing to see here" in NZ's buildings. (Comment in bad taste deleted, Ed). I apologize but I have been very upset as I know people in that building. Sandwich panel construction is common in industrial buildings but there was a push many years ago to move away from expanded polystyrene (EPS) core panels. There's a large range of mineral fibre insulation and PIR cores which are very resistant to fire spread. It unlikely anyone would want to use sandwich panels for a multistory building as it would be a pretty terrible solution. It's suited to long runs of material and not being broken up by window penetrations. There are also building code rules around floor and wall junctions where there should be a fire barrier to stop rapid fire spread between floor levels. The big issue with Grenfell Tower is that the building was recently retro fitted with these panels to improve the insulation of the building envelope. For the equivalent work in New Zealand even if the wrong product was used you would be required to install a fire alarm system throughout the building and have 6 monthly trial evacuations. The fire alarm system is what gives everyone automatic alerting and the evacuation training is so that people know to leave the building and not stay in the building while it is on fire. There are smaller buildings that only require a manual alarm system but that's better than knocking on people's doors while they're asleep in the hope that they'll wake up and evacuate. What happened in Melbourne is that the developers submitted plans to council stating one brand of cladding would be used (approved) and then they substituted it for another brand (cheap Chinese stuff) during the build. No one ever checks to see if the brand is the same, and it just gets signed off. In Melbourne they have identified over 50 residential towers with this cladding, but only two (one that caught fire, and another one) have been ordered to do something about it. The cost of remediation is $128,000 per apartment. They are death traps in the making - especially since many of them are rented to students and immigrants on a shared room basis, so there can be 8-10 people living in a 2 bedroom apartment (which is why the Latrobe building went up, as tenants were storing stuff on the balcony due to there being too many people living inside the apartment). From other fires I've seen in Australia there are combustible claddings that for some reason comply with the requirements. There seem to be a number of problems.